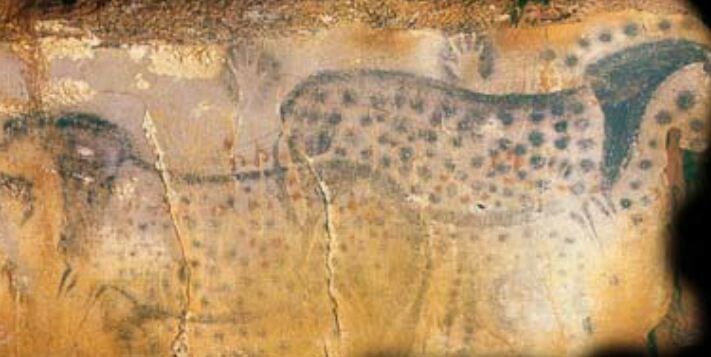 A prehistoric mural from the Pech Merle cave in France. Photo by Dean Snow. Cracking the stone ceiling: A new study, led by archaeology faculty member Dean Snow, suggests that up to three quarters of the earliest-known cave paintings were made by women. By identifying female hand prints in the paintings (which include depictions of animals, presumably to chronicle the results of hunts), the researchers determined that women may have also taken the roles of hunters in prehistoric times. “It wasn’t just a bunch of guys out there chasing bison around,” Snow told the National Geographic. So, women not only brought home food for the family, but also did the interior decorating. Um, anyone else not at all surprised by this? Recalculating route: Penn State geography prof Anthony Robinson just wrapped up the world’s first digital-mapping open online course (or MOOC). In this Maclean’s article, Robinson talks about the “democratization of cartography” — how, with a little know-how, map-making is now accessible to the average joe. And, perhaps even more important, thanks to GPS devices, today’s kids will grow up in a world where parents never fight over whether or not to pull over and ask for directions. Whiteout Cancer: Last year, Penn State senior Kayla Nakonechni camped out in Nittanyville, co-chaired the homecoming committee, and danced in THON — and in August, she was diagnosed with cancer. To support Kayla and her family, a group of her friends designed “Whiteout Cancer” T-shirts, now on sale at Old State Clothing Co. in downtown State College for $10 a pop. Funds raised will help pay for Kayla’s treatments. To purchase a shirt over the phone, call 814-234-1415. And to follow Kayla’s journey, check out her blog, aptly named, Life is tough, but I’m tougher. Entry filed under: Uncategorized. Tags: Anthony Robinson, Dean Snow, Kayla Nakonechni, Whiteout Cancer.